How I Gained it: I love food. No, I really love food. This love for food has caused me to yoyo my weight for all of my life. As a child I was always “chunky,” and then into my later teens I lost weight not by eating right and exercise, but by starving myself. Then, when I went off to college, I gained all of the weight back, plus my freshman 15+. I continued to gain weight at college because again, I LOVE FOOD. And not being at home meant that I could eat what I wanted, when I wanted it. In my senior year of college, I moved off campus and it caused me to walk several miles one way to my classes. Much to my surprise, I lost weight again. Unfortunately, I still hadn’t learned the important lessons about controlling my portion sizes, about eating healthier options and the importance of daily exercise, and once I graduated college and got married I started to gain again. This time though, my gaining put me at the unhealthiest weight that I every achieved. Breaking Point: In September 2011 on a girls weekend away from home, I told my girlfriends that I hated myself. I hated everything about myself. My look, my weight, my body, my everything. Although I confessed this in September, I did nothing. I continued to dislike everything about myself and this disgust began to spill over into all aspects of my life… my marriage was suffering; my kids were feeling the effects; my job performance was low. My weight was now causing problems in every corner of my life and I knew that things needed to change, and change quickly. How I Lost It: First I downloaded an app to my phone called Lose It! After reading about various “weight loss” programs and apps, I found this one to be the easiest to use for me. It is simply a calorie counting app that provides you with the number of calories you should eat in order to lose weight each week. I focused on my food choices and portions for six straight weeks, through two major holidays. The app really allowed me to learn about my food choices, how to eat right, how much to eat and how to budget my calories for an entire day. Although this sounds easy, for someone who ate what she wanted, in the amounts that she wanted for 30+ years, it was nearly impossible, but I was determined not to give up. In January 2012, I joined my local YMCA so that I could begin to exercise. At first, I couldn’t even do 15 minutes on the elliptical machine. But being the determined and strong-willed woman that I am, I went to the gym every day, seven days a week and gradually built myself up to doing 65 minutes on the elliptical machine. Then, in March 2012, a lady that I met at the gym said to me “running melts the fat.” That’s all I needed to hear. I downloaded a Couch to 5K app (C25K) and completed that in seven weeks. While doing the C25K program, I actually registered to run in the Pittsburgh Great Race 10K, which was on September 30, 2012. I wasn’t even up to running a 5K yet, let alone a 10K, but I knew that I needed something to strive for. I am happy to report that I successfully completed the Great Race 10K on September 30, 2012 and have now signed up for the Pittsburgh Half Marathon in May 2013. It feels a little crazy, but this again gives me something to work toward — a challenge. 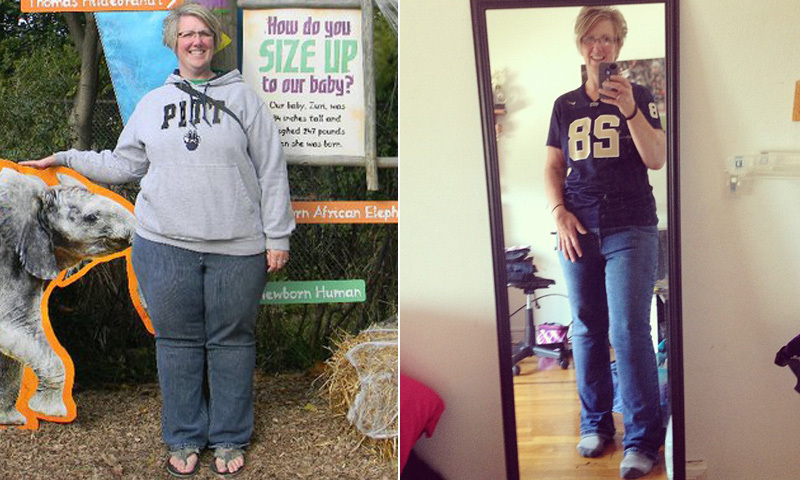 RELATED: How I Lost Weight: I Lost 120 Pounds Without Gastric Bypass, Pills Or Gimmicks! I am now down 93 pounds and although the weight loss has slowed down, I will reach my goal of 101 total pounds lost. I love that I am able to do things that I never thought about doing… running, hiking, biking and even more, including some day watching my grandchildren grow up. There are still things that I need to learn, like how to ignore the brownies that are in the kitchen calling my name. But until that time, I will count the calories for the brownies that I eat and in turn budget my daily total appropriately. For the first time in my life, I can say that I love myself. I love how I feel inside. Does anyone know if there is a Couch to 5k app for walking not running? I have arthritis in my knees and ankles so running intervals is a no no. Samantha, THANK YOU for sharing your story, very motivating… I appreciate your honesty about the self loathing- in there myself. Consider swimming if you have access to a pool. I’m also on a limited income, so gym memberships are out for me, but my apartment complex has a pool and I swim 3-5 days per week. You can burn 500 plus calories in an hour of swimming depending on your weight. I actually burn closer to 1000 calories beause of my size, and it makes weight fall off as long as you’re careful not to eat back the calories you burn. You don’t even have to swim laps, just keep moving. I swim a couple laps but find it borning, so I tread water, do jumping jacks, swim underwater, throw around a beach ball, and generally just play around and have fun. I’m so glad I follow this page. You are amazing! Go YOU!!! Fantastic! Which app did you use to track as there are several. Great work !!! Friend me to give me tips and motivation pls! Very inspiring! You look fantastic! Awesome! My hubby ran the Pgh. Half Marathon in 2013 also. My son graduated from Duquesne a few weeks later. Awesome! Such an inspiration! Thank you for sharing!! What a great success story! Awesome!!! She looks great! Such an inspiration! Amazing! Way to keep at it. Inspiring! Very happy for you! Congratulations! I am truly inspired by you. Keep up the good work. You are an inspiration to us all..ty for your story….I’m going to try these applications. I lose it! She looks great! I use lose it and love it down 13lbs so far!!! I lost 80lbs thanks to phone apps too. Congrats on your weight loss! Wow… That is an amazing transformation!